A gift set of 3 kids handkerchiefs with bright colourful edges and numbers with simple mathmatics design. 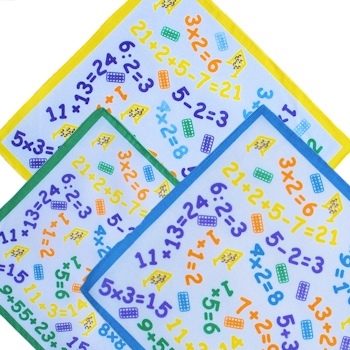 A gift set of 3 kids handkerchiefs with bright colourful edges and numbers with simple mathmatics design. Little kids will love their very own set of hankies. A special small childs size hanky to fit perfectly into their pocket so its at hand to help runny little noses and catch those sneezes. 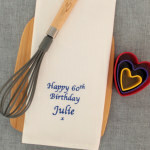 For a small additional fee we can personalise the handkerchiefs with initials or a short name - just choose Yes and fill in the options box. If you prefer these without personalisation please mark the No option and leave the box blank. We will coordinate the embroidery colour to match the hanky. A handy feature to have for children in Nursery or school. Only yellow and green trim alphabet hankies available. Please note: At Amys Gifts we do all our own embroidery work especially made to order and do our best to get all orders dispatched within approx 48 hours.